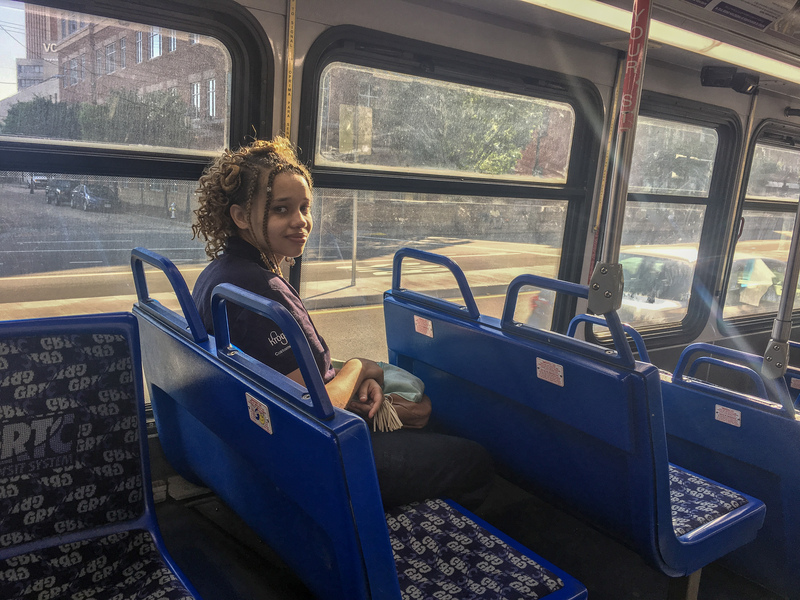 The first installment of a monthly series in which a hometown Richmonder who has spent over a decade abroad explores the many different neighborhoods accessible by GRTC bus lines to find the ways GRTC connects us all. Walking down Hull Street it doesn’t take much imagination to envision Manchester in its glory days as the seat of Chesterfield County — and later a proudly independent city — that flourished in the Reconstruction era. 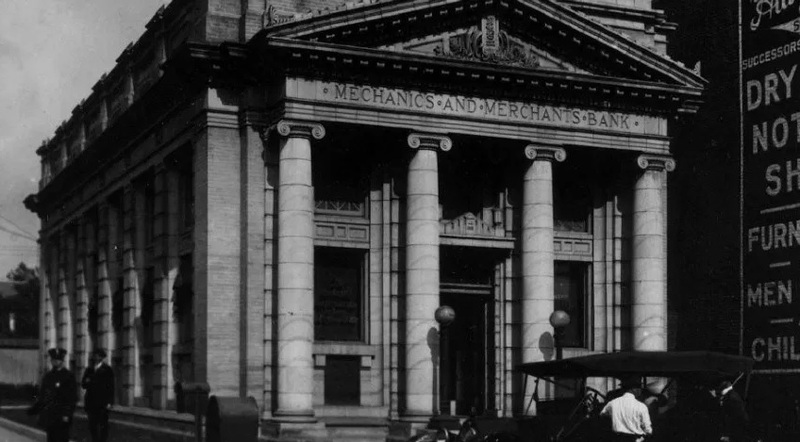 Manchester Courthouse and the Mechanics & Merchants Bank remind visitors of the building boom and prosperity of the 1870s and ‘80s, as newly freed blacks abandoned plantations to find work at the city’s bustling docks, to open shops and eateries, and to make something of their newfound freedom. The Late Gothic Revival style of the First Baptist Church of Manchester (today “South Richmond”) personifies the confidence and hope of the day that inspired our city’s oldest independent black congregation to build such a grandiose church along Manchester’s main boulevard. From the Valentine’s Cook Photograph Collection. The shuttered storefronts and dilapidated homes tell a very different tale today. Beyond Manchester’s remnants of grandeur, one begins to notice a pattern of neglect. It may be tempting to blame individual property owners or generic urban decay; however, such facile logic belies the systemic abandonment of “Dogtown” — the derogatory nickname Richmonders came up with for their Southside sister city. After the Supreme Court ruled “separate but equal” schools unconstitutional in 1954, wealthy whites began to flee urban Richmond in favor of the mushrooming suburbs of Chesterfield, Henrico, and — to a lesser extent — Hanover. The failure of Massive Resistance only expedited the trend, leaving large swaths of Manchester abandoned. Since the 1930s the federal Home Owners Loan Corporation deemed Manchester investment grade D due to its “infiltration of a lower grade population” (read: blacks). 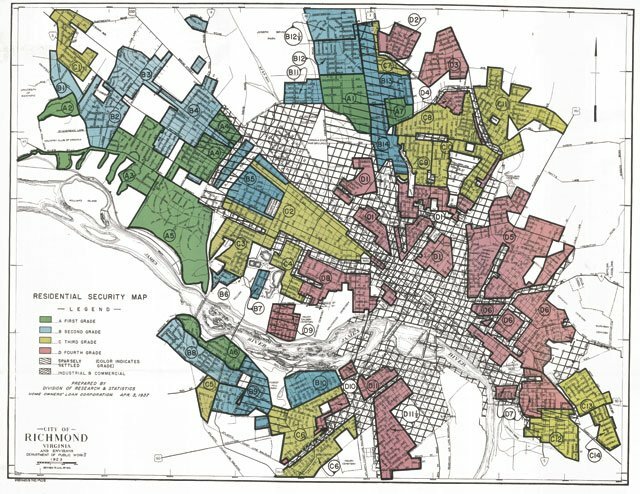 This practice of redlining excluded residents from mortgages and other lines of credit available to those who lived in wealthier and whiter neighborhoods. The Urban Renewal policies of the 1960s struck another blow to Manchester as federal funds financed the removal of “blight” (i.e. dense, black communities) in favor of public housing like Hillside Court. In the decade after the Housing Act of 1949, 425,000 units of housing were demolished in black communities across the country while only 125,000 were built. Suburbanization meant retail flocked ever further south and west, with the construction of Southside Plaza and Cloverleaf Mall, respectively. Several smart investors recognized the opportunity in Manchester and opened pioneering Southside businesses like Croaker’s Spot and Legend Brewing in the 1980s and ‘90s; however, the revitalization of this charming historic neighborhood didn’t truly take off until the early 2000s. The establishment of the Manchester Historic District and the rezoning of the area’s former tobacco warehouses to loft apartments triggered a wave of investment. The expansion of Capital One and the addition of amenities like the Floodwall Walk and the T. Tyler Potterfield Memorial Bridge have brought new attention, new residents, and new tensions to Manchester. The renovated Hull Street Library, Dogtown Dance Theater, and all the sleek new lofts represent the dawning of a new era for this Southside neighborhood. The Manchester food scene may soon become its own genre of Richmond’s culinary boom, thanks to standouts like Camden’s Dogtown Market, Pig & Brew, Ironclad Pizza, Soul-Ice, and the Butterbean Market & Cafe. Across the street from the Butterbean & Hot Diggity Donuts, the owners of those two establishments are also opening Dogtown Brewing Co. — complete with a scenic, fourth floor rooftop bar that feels like something from Washington, D.C.’s U Street. Your correspondent began his day with a delectable $3.25 cup of cold brew from Brewer’s, a sum on par with any other quality coffee shop in the city that still feels unattainable to many who live in Manchester. Just across the street from Brewer’s, new housing is going up, filling a block long left empty with new life. This is the contradiction of modern Manchester. The area’s sprigs of growth promise a better future and higher quality of life, but many of today’s residents question whether they will be able to afford to stick around and enjoy it in a decade. After boarding GRTC’s 1A at Commerce Road, your correspondent enjoyed the river views while crossing the Mayo bridge, trundled through Downtown and up Chamberlayne Avenue, and alighted the bus in Ginter Park at Westwood Avenue in under twenty-five minutes. 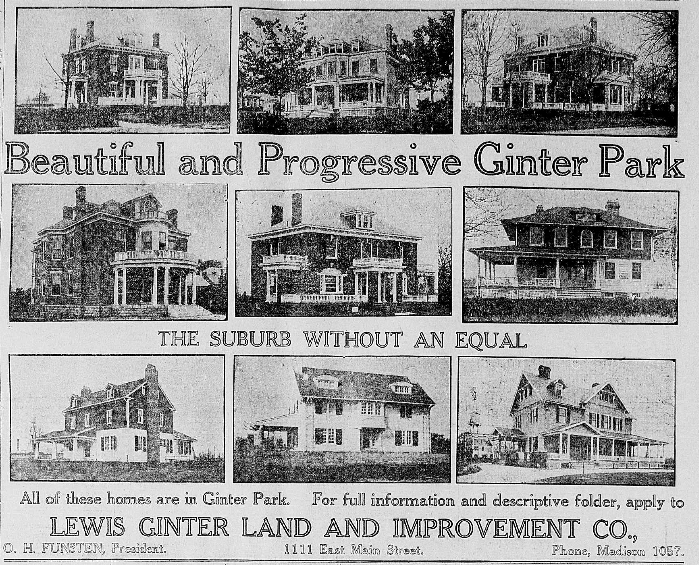 Ginter immediately set about crafting his eponymous neighborhood in a meticulous manner. First he laid out an extended street grid and divided the parcels into single-family lots, so that each new resident could build their home of a size and style of their choosing. 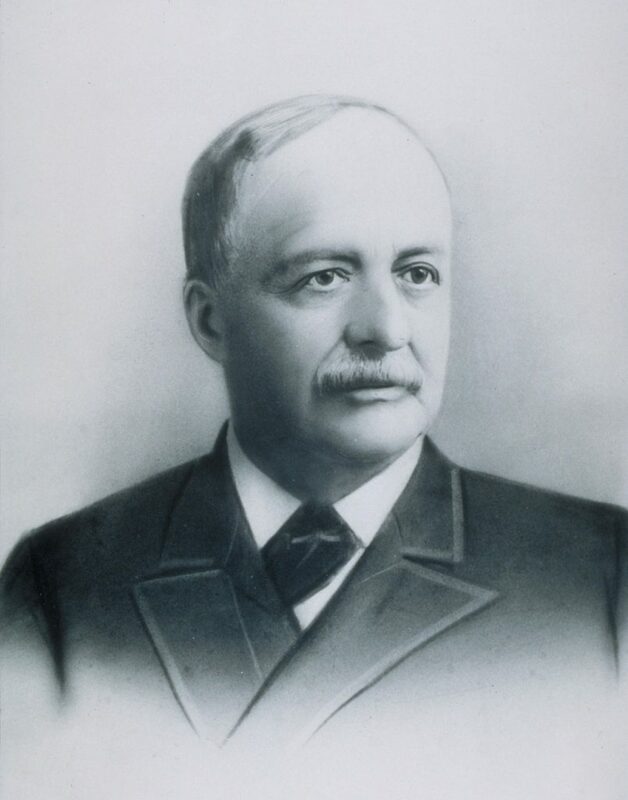 Next he gifted Union Theological (today “Presbyterian”) Seminary a large plot of land at the center of the community in order to lure them from Hampden-Sydney in Farmville and serve as the anchor of his development. If the artesian well water and shade-lined boulevards weren’t ritzy enough to entice investors, Ginter even finagled the extension of Richmond’s first electric trolley line up Chamberlayne Avenue (mirroring today’s GRTC Route 1) so residents could enjoy a fifteen minute commute downtown for just a nickel. Unfortunately, upon the magnate’s death in 1897, only a few cottages had so far been constructed. Ginter Park wouldn’t begin to boom for another decade. Post-1908, construction raced along until a brief slump during World War I, but quickly picked back up during the Roaring Twenties. This prolonged period of building created a rich architectural legacy, with homes ranging from humble cottages to grandiose mansions. The rise of the automobile and the desperation of the Great Depression caused residents of Ginter Park initially to welcome Chamberlayne Avenue’s designation as U.S. Route 1 — the great North-South corridor that served as the precursor to I-95. However, the resulting heavy traffic and many large trucks began to deteriorate residents’ quality of life and destroy the fabric of the neighborhood. By the end of the 1950s, many of the area’s once-luxurious manors and mansions had been converted into tourist homes and nursing homes, or were completely demolished in favor of multi-family apartment complexes. Much of the rezoning which so tragically altered Chamberlayne Avenue’s character excluded the rest of Ginter Park, thus allowing the majority of this verdant suburb to dodge ugly redevelopment. Although former Governor Doug Wilder and Senator Tim Kaine call Ginter Park home, perhaps the legacy of the area’s other most famous resident, Joseph Bryan, best encapsulates the arc of the neighborhood’s character. The newspaper man behind the Richmond Times bought land off of Laburnum in 1883 and built himself a palatial brick mansion, which the Bryan family later donated to Richmond Memorial Hospital. After serving as the hospital’s east wing for decades, the entire structure was renovated in the late 2000s to become luxury condominiums. 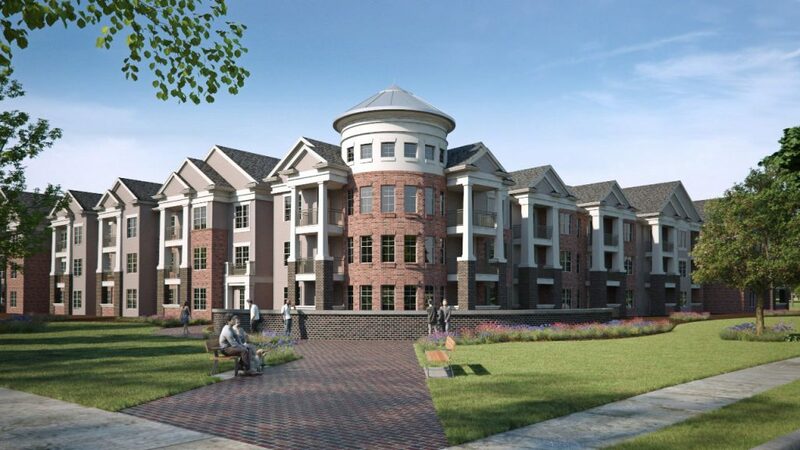 With multiple massive apartment complexes in the pipeline for Brook Road and Chamberlayne Avenue, one can understand the apprehension of Ginter Park’s residents toward further development, even if one may not agree. For many, their neighborhood’s delicate balance between historic homes and condo complexes hangs in the balance. If Richmond pundits were right that the debate over the Brook Road Bike Lane was really a referendum on the future direction of the area, then the resounding defeat of Councilmembers Gray’s and Hilbert’s ordinance to block the bike lane may signal Northsiders’ increasing demand for the dense, walkable trappings of New Urbanism — the currently en vogue planning movement towards sustainable, mixed-use communities. Walking along Ginter Park’s many leafy lanes, it’s not hard to imagine all the empty lots and aging apartments being replaced with more tasteful, denser housing in the coming decades. Indeed, if the GRTC Pulse ever expanded to include a North-South route, the lure of a convenient commute from Northside through to Manchester may prove irresistible for developers and locals alike. After living abroad for a decade, a hometown Richmonder will take one GRTC bus route a month to explore neighborhoods at opposite ends of the track — and showcase what’s near and dear to locals’ hearts at each stop along the way. What would New York be without the subway, or San Francisco without its streetcars? Just hearing the phrase “mind the gap” makes people across the globe dream of London’s Underground. Transit is iconic. Transit is often the first thing visitors to a city come in contact with. Whether you catch a cab, take a public train, or ride a private bus into town from the airport says a lot about the culture — and the priorities — of those who live there. Taking transit around a city gives you an unfiltered look at the way people live and move about that place. 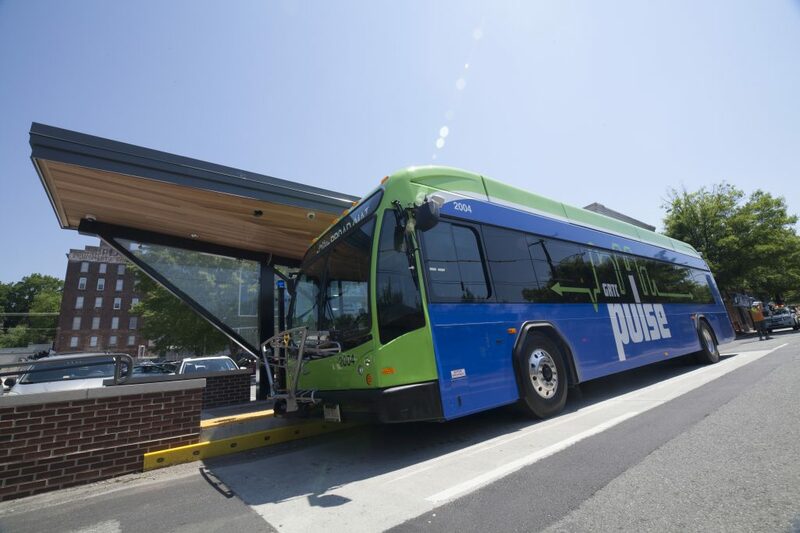 Last June, Richmond’s GRTC ushered in a new era of investment in our region’s long-neglected and underfunded transit system, when it launched the Pulse Bus Rapid Transit (BRT) line and rolled out redesigned routes. 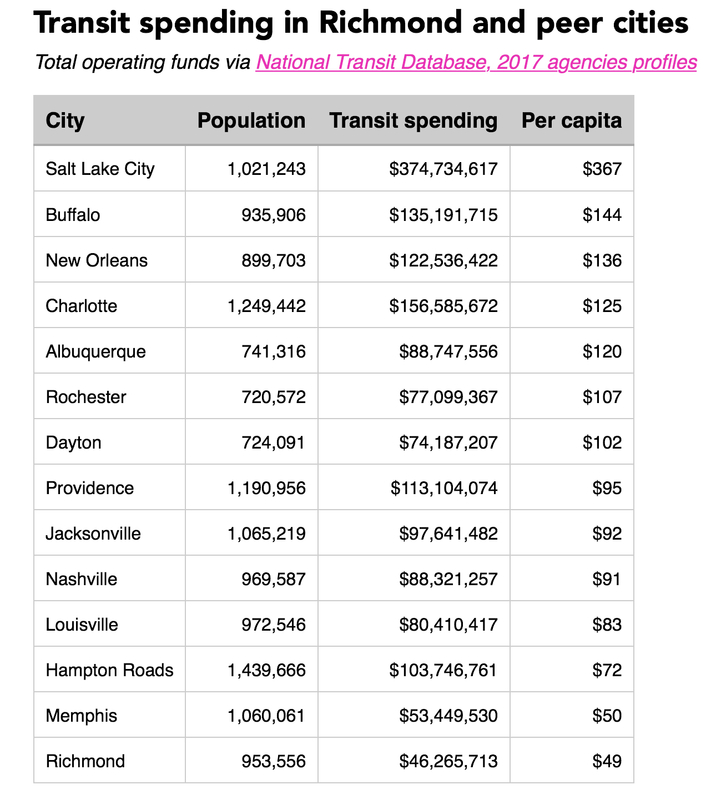 The chic new BRT and more efficient routes represent an effort not only to provide better service, but also to grow ridership through attracting “choice riders” — people who can afford a car, but would choose to ride a bus if it’s convenient. I was born and raised in Richmond long before our region adopted this moniker, but I never once took GRTC. Growing up in Chesterfield in the 1990s, I lived in a suburban bubble that provided me few opportunities to explore our region. After living abroad for the past decade, I moved back to my hometown a few months ago, eager to finally see a more complete picture of the city I’ve been telling people I’m from. That is why I decided to launch this series: GRTC Connects. Armed with the newly launched transit app, each month I’ll be taking one of GRTC’s bus routes from end to end and exploring two neighborhoods at opposite ends of the route. In each neighborhood, I hope to paint a picture of the architectural identity, culinary highlights, and historic sites that make these places dear to Richmonders’ hearts. Beyond showcasing Richmond’s geographic and cultural diversity, I’ll be choosing neighborhoods with varying demographics and histories to foster conversations on the legacy of redlining, disinvestment, and gentrification within our region. In recent years, Richmond has risen up the rankings of the “Best Places to Live” lists and solidified its reputation as one of the top towns in America in which to get a degree, raise a family, or just enjoy a weekend getaway. The newfound national attention being lavished on our city should serve as a reminder to Richmonders that we have an exciting urban landscape filled with many distinct, vibrant neighborhoods just a bus ride away. For just $1.50 you can join me and take transit on an adventure to see how GRTC connects us all. One of the newly-launched GRTC Pulse buses was in a collision with a pickup truck that was making a left-hand turn through the dedicated bus lane on West Broad Street, around 5:50 this evening, at the intersection of Broad and N Allen Ave. Neighbors who witnessed the aftermath called the intersection dangerous. Among them were Kim Washington and Renada Harris, co-owners of Silk Hair Studio at the corner of Allen and Broad, who said accidents happen regularly in the intersection. When asked how often, Harris said accidents happen “Once a week.” Washington had her own estimate. “No, every two weeks. Maybe once a month,” she said. Washington said she’s contacted the city several times about the intersection in the past, but no one has ever followed up with her. She and Harris pointed to the unusual layout of the street to explain the frequent accidents. Allen doesn’t run directly across Broad; it’s separated by about 75-feet of asphalt, and left-hand turns are barred from Allen next to their hair salon. Harris said it’s a confusing intersection, especially for people who aren’t used to the area, and agreed with Washington that it needed some safety improvement. “It should be a right turn only from this side, and a right turn or straight from the other side,” Harris said. “It already is,” Washington added. Both women agreed that the intersection could use a redesign to improve safety. 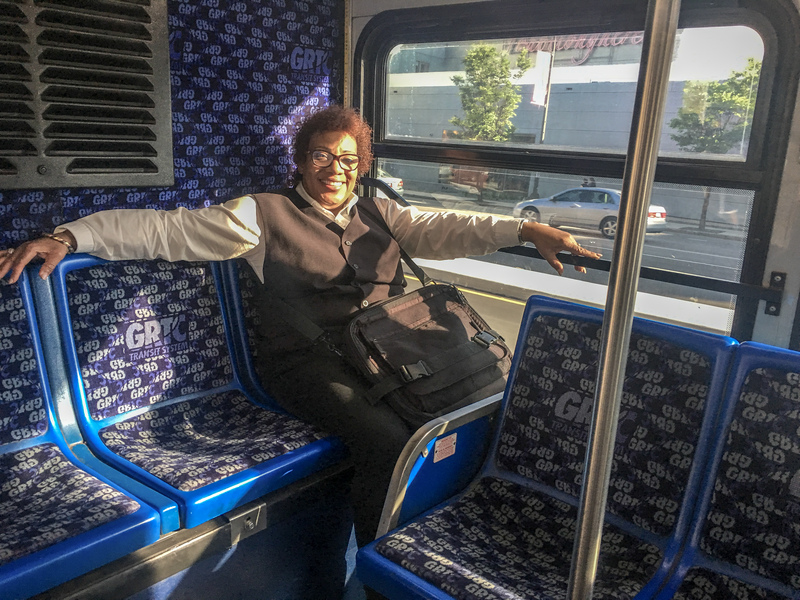 The surprisingly contentious GRTC Pulse bus line is finally opening, and while it still has critics, it’s also building support among the people who actually ride it. You can’t miss the new Pulse stations all over Broad Street, and they’ve inspired some controversy in the surrounding communities. Until this assignment, I too was critical, but had never ridden the bus. I didn’t realize how many people depended on it, or how it shaped the way they spent their days. On my first-ever ride, I noticed how the frequent stops pushed what could have been a 9-12 minute trip into almost 25 minutes. For riders, this is a big part of the appeal of the Pulse. Fewer stops make for faster service, and it seems to answer many of the complaints bus riders had. Still, at least one rider wasn’t looking forward to changes. On my ride, coordinated with GRTC, a man in his mid-60s saw the logo-emblazoned bag they’d given me, full of brochures, and gave me a strange look. When our eyes clicked again for the second time, he began to vent his frustrations with the bus service, detailing years of complaints. He said he’s been riding the bus since the 70s and claimed nothing had changed in that time. He was angry about the lack of bathrooms, which said was not fair, especially for elderly riders. He was also angry about long wait times at bus stops, and thought the Pulse would be a waste of time and money because he thinks nothing is going to change. The Pulse will free up existing buses for other routes, according to Carrie Rose Pace, Director of Communications for the GRTC, which will address Waite’s problems with her existing commute. For riders on the new 7.6-mile line, linking Rocketts Landing to Willow Lawn, they won’t have bathrooms, but they’ll receive lower wait-times on a faster, high-capacity system designed to get them where they’re going quicker. She said she’s a bus rider, too, who sometimes uses the current system to go to and from her home in downtown Richmond. The changes will benefit her and her neighbors, she said, by letting them use the bus over private automobiles or driving services like Lyft. 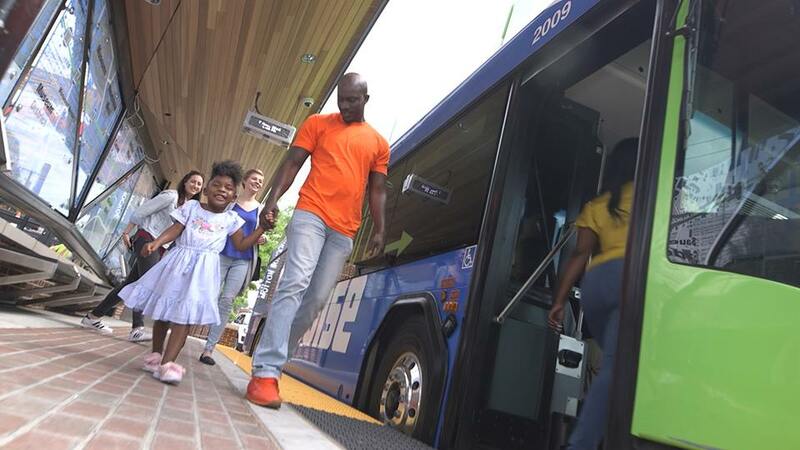 GRTC estimates that some 3,500 people will ride the Pulse daily, which could also benefit people driving cars, too: Every person on the bus is one less car on the road, easing congestion and freeing up parking spots at destinations. “Each individual Pulse bus seats about 36 passengers,” Pace said. 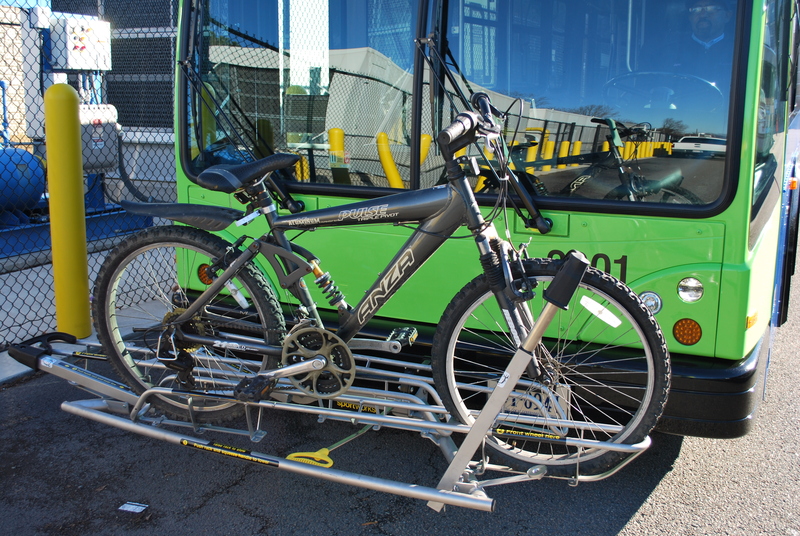 “But with fully-loaded standing room, we can safely accommodate 55 passengers.” That includes space for two individuals using mobility devices like wheelchairs, and bike storage on the front of each bus for up to three bicycles. While most bus users will see a slightly different and faster route on launch day, different routes will operate differently. GRTC has updated their website with a detailed system map to help riders plan their trips ahead of launch. In our hyper-connected modern era, there were other benefits to public transit that I saw on my bus ride. It’s time to read a newspaper or stare at your phone; catch up on work; listen to music; or simply ponder the issue of the day, without having to watch the road. All of which will be even easier on the Pulse, which is launching with free Wi-Fi. Ultimately, Pace stressed that the goal was to consider the safety and efficient use of the corridor for all people, regardless of their mode of transportation. The new signals, lanes, crosswalks, and overall design were all reached through a process that prioritized safety for all. If, like me, you’re curious about the Pulse, you’ll be able to hop on for free for the first week, June 24 to 30. After June 30, tickets are $1.50, with a reduced fare of $0.75. The system accepts the unlimited ride passes used on the rest of the GRTC network, and paratransit customers have unlimited free access. Operation is 5:30 a.m. to 11:30 p.m. on weekdays, 6 a.m. to 11:30 p.m. on weekends. During peak hours, 7 to 9 a.m. and 4 to 6 p.m., buses run every 10 minutes. Off-peak, every 15 minutes.